Located on the eastern border between Germany and France, this French region has been heavily influenced by its German neighbours. Its production is mostly made up of heavily-aromatic and age-worthy white wines, which are some of the finest in the world. The vast majority of the countries wines are single varietals produced from one of the four noble grape varieties – Riesling, Gewurztraminer, Pinot Gris and Muscat – which are available in a variety of styles; from dry and off-dry through to lusciously sweet. 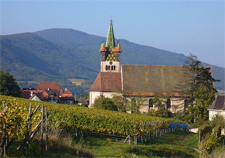 Like Germany, its best vineyards are located on the steepest slopes but crucially here, the Vosges Mountains serve to protect the vineyards from the strong prevailing rain-bearing winds from the west. Heavily steeped in tradition, Alsatian producers pride themselves in making the very best. With producers such as Zint Humbrecht, specialising in producing super low yields and non-interventional winemaking, give age-worthy and extraordinary wines with real distinction. Our list is never boring, with the likes of Hugel, Trimbach and Schlossgut Diel to choose from. Riesling Schieferkopf "Lieu dit Buehl"
Riesling Schieferkopf "Lieu dit Fels"